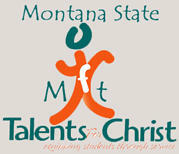 Montana Talents For Christ helps teens develop their God-given talents for ministry within the local church. It encourages students to prepare and to gain skill for serving the Lord. Students may choose to compete in one of two categories: either the Open category or the Scholarship category. The Open category is for students just developing their skills. If students choose to compete in a Scholarship category, they have the potential of qualifying for camp scholarships. Develop skills—MtTFC provides an intentional opportunity to train and equip students for particular ministry roles such as vocal and instrumental service, preaching and speaking, and Bible teaching. Build confidence—MtTFC helps students gain confidence as they practice and improve their skills for serving the Lord. Gain direction—MtTFC gives students a high view of ministry and prompts students to consider roles God might desire them to fill in their future. Make friends—MtTFC brings students from many churches together for competition. These events contribute to a growing network of friends. Establish identity—MtTFC cultivates in students a sense of heritage and connection with like-minded Baptists from across the country. Students in grades 7–12 with at least a C average. Members/Regular attenders* in good standing of a church or mission church/church plant in fellowship with the Montana Regular Baptist Fellowship. *Regular attender status will be determined by the Pastor/leadership of the sponsoring church.